Tragedy struck Las Vegas, Nevada on October 1, 2017, when a lone gunman opened fire onto a crowd of twenty-two thousand people attending the Route 91 Harvest Festival, injuring over five hundred people and killing fifty-eight. Overnight Las Vegas became the site of the deadliest mass shooting in modern American history. The staff at UNLV’s Special Collections and Archives were shocked and horrified, and the impact of this tragic event has been shocking and surreal to the Las Vegas community. Shortly after October 1, the Special Collections and Archives staff began to think of what we could do to help. Reflecting on our mission to document Southern Nevada, we realized that we had a critical responsibility to preserve this history so we could study, remember, and reflect on it later. As the manager of UNLV’s web archiving program I knew that I wanted to capture what was being said on the Web about this tragic event. Inspired by Archive-It’s Spontaneous Events collections and many other collections that document current events, I created a web archive collection which includes over two hundred links that document the local, national, and international reaction to the shooting on the Web. The Web Archive on the October 1, 2017 Shooting in Las Vegas, Nevada aims to preserve the diversity of reactions to the massacre from across the country. The Special Collections and Archives staff brainstormed what we should be preserving on the Web. Knowing that the Web is ephemeral and fleeting we wanted to act quickly on capturing content as information was being updated. 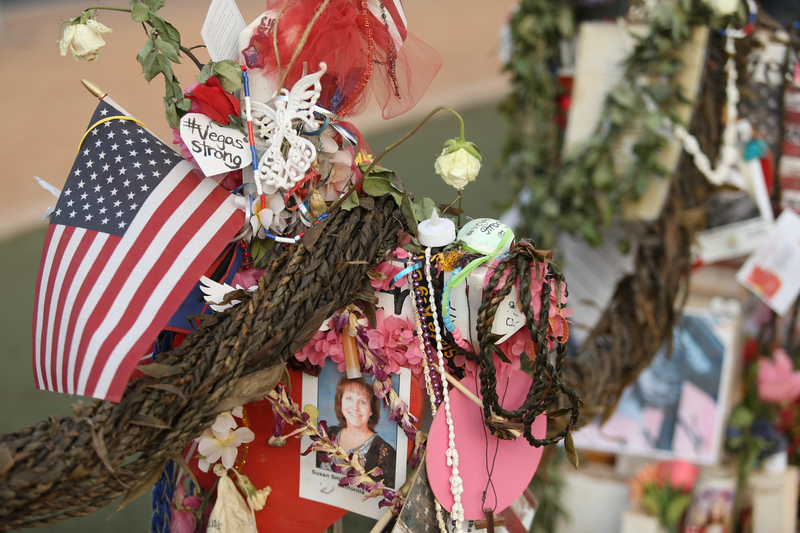 We wanted to preserve reactions and stories from the local Las Vegas community, YouTube videos of survivors’ stories, and news stories from all sides of the political spectrum. We started with archiving websites for the local community such as educational institutions, the government, and the news media. And while we focused on archiving news stories from the local media, we also cast a wide net to capture the broadest voices. After several months of identifying and capturing content our next challenge lay in creating descriptive metadata for the collection. We decided to create a finding aid (PDF) that would be discoverable via the UNLV University Libraries catalog and the UNLV Special Collections and Archives finding aid interface. This meant that we needed to create metadata that could be repurposed for three different platforms (Archive-It, UNLV Libraries catalog, UNLV Special Collections and Archives finding aids database) that use three different content and descriptive standards. At UNLV we have developed our own in-house finding aid manual that requires using DACS elements to provide added value to our descriptions. 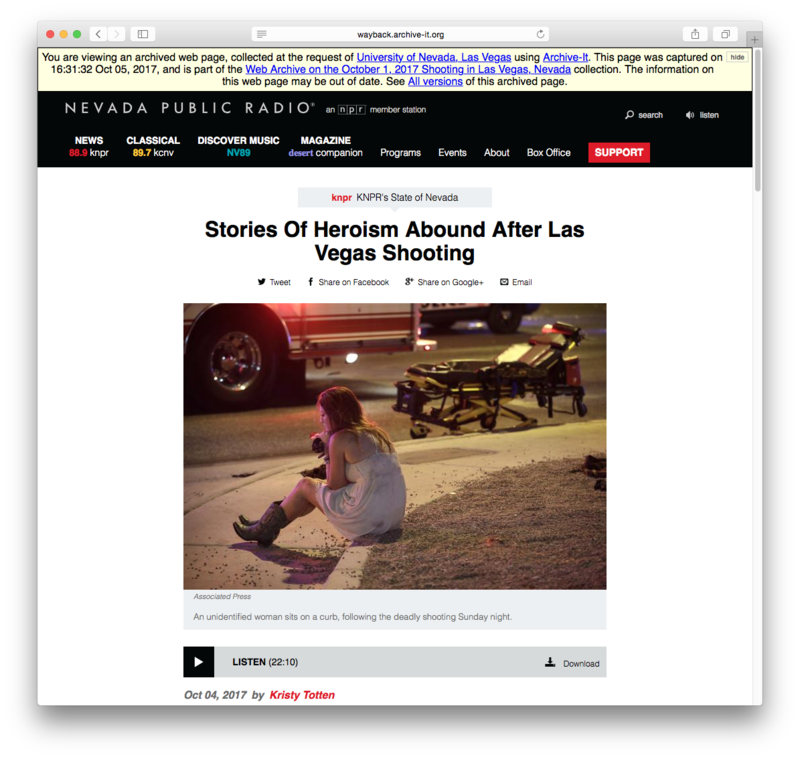 The Web Archive on the October 1, 2017 Shooting in Las Vegas, Nevada is the first web archive collection with a finding aid for UNLV. As a member of the OCLC Research Library Partnership Web Archiving Metadata Working group (ORLP-WAM), I was excited about implementing the recently published recommended best practice guidelines developed by ORLP-WAM. Using the best practice guidelines and the UNLV Special Collections and Archives finding aid manual I developed a metadata crosswalk to enable creation of descriptive metadata that can be repurposed across multiple platforms. The web archive is described as a larger body of data collected as part of the effort to document the October 1 tragedy. The collection also includes Twitter data captured using twarc, a command line tool and Python library for archiving Twitter JSON data developed by the Documenting the Now project. Describing two different sets of archival data in one finding aid proved to be challenging. Each set of data requires different access points and conditions governing use based on Twitter’s Terms of Service and our standard use policy at UNLV Special Collections and Archives. The collection describes each set of data as two separate series (I. Archived websites and II. Twitter datasets). We also assigned ARK identifiers at four different points: the ArchivesSpace finding aid, Archive-It collection URL, and for each of the assigned groups in the Archive-It collection. This way we are able to provide multiple points of access between the collection and the finding aid. In the end, we hope that however users discover the collection they will be able to seamlessly access both the content and the description across all of our various databases and catalogs. 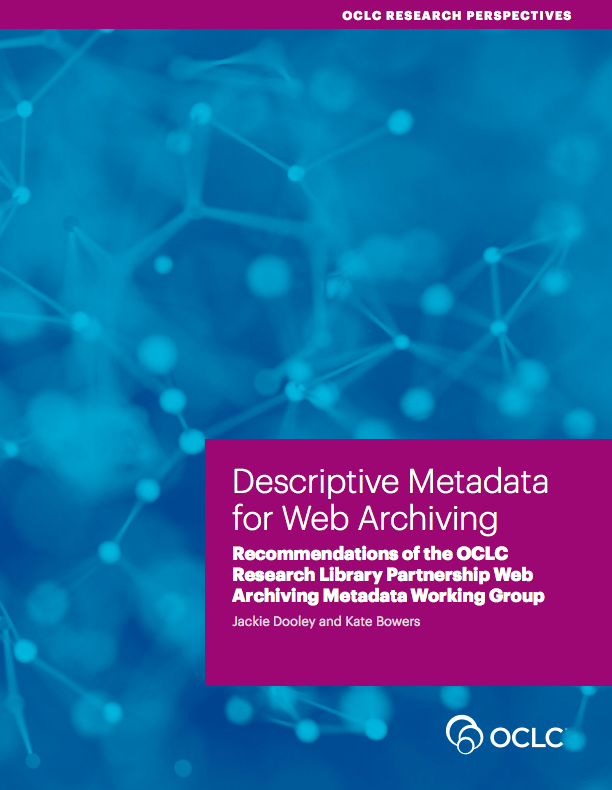 And, now that we have developed our own guidelines for describing web archives, we look forward to continuing the practice and creating descriptive metadata for our other web archive collections.